As lighting designers, creating integrated solutions that reveal and enhance the architecture, is central to our work. Yet, as advisors to our clients and advocates for the users of the spaces we design, our concerns are necessarily broader. Issues of first time and long-term cost, ease of maintenance and durability matter to facility owners. Flexibility and ease of use are as important as the quality of light to occupants. Environmental sustainability is of vital concern to all of us. Principal and Owner Maureen Moran leads a team of designers and managers who each bring special expertise and their unique perspective to the firm. The depth of professional expertise and technical talents allows us to design a diverse range of projects. These include but are not limited to educational facilities, performing arts buildings, historic preservation, museums and exhibits, retail showrooms and centers, restaurants, hotels and resorts, conference centers, libraries, and sustainable design. We work with state-of-the-art computer and office resources including AutoCAD for computer-aided design, Revit for building information modeling, and AGi32 for lighting calculations and daylight simulations. While we are specialists, we take a holistic approach to lighting design by collaborating closely with the entire team, by bringing our knowledge of current design and advanced technology to projects, and by making a commitment to sustainable solutions. From the daylighting at a public library to low lights for a hip club, from a historic facade to an efficient office, from the skyline to the riverfront – our talent team is working on the right design for each environment. MCLA Inc. is 100% woman-owned and has been a Certified Business Enterprise (Small and Local) in the District of Columbia, a Minority Business Enterprise by the Maryland Department of Transportation, and nationally by Women’s Business Enterprise National Council (WBENC). 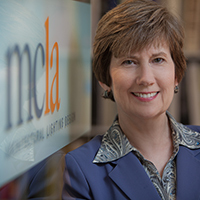 In 2012, Ms. Moran opened a second company – MCLA VA, Inc. – which is based in Washington, Virginia, and a Small, Woman, and Minority (SWaM) certified business.